I discovered a new (to me) hand spinning technique. I planned to make a standard 2-ply yarn but then used a core thread to make it a supercoil. I made a “tutorial” (one picture, haha) to show how I hold my hands to make the technique work. My left hand holds the core thread and I usually wrap it around my fist once for extra tension. My right hand holds both plies of handspun. I use a grip similar to a long-tail cast on: my pinkie and ring finger grasp both strands, and I use my thumb and index finger to keep them apart. The separation prevents them from twisting around each other so that each ply will wind into the coil smoothly. Then spin a few inches at a time, pausing to pull the core thread tight and scrunch the coils up toward the orifice. Below are pictures of the two yarns I’ve made with this technique so far. 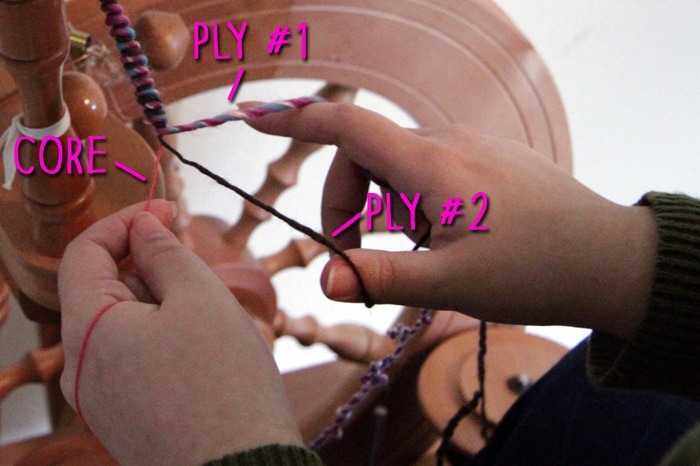 On the left, the yarn was spun using the fractal spinning technique. (I used dyed top. 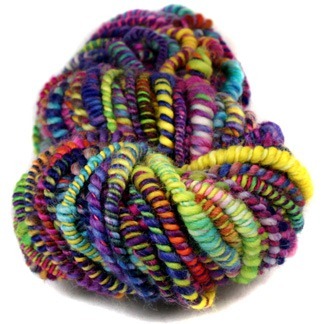 The first half was spun in one big chunk with long color repeats. The second half was split into tiny lengthwise sections for short color repeats. 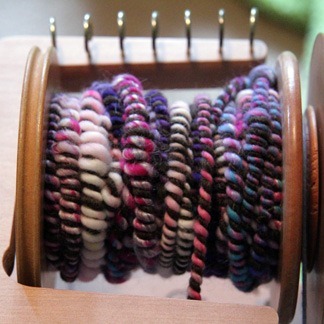 I wound it into a center-pull ball and plied from both ends.) On the right, I combined two yarns from separate bobbins. That looks awesome!!!! Great explanation I may have to try that sometime. Am going to have to try that! How durable is the coil? Can you use it for rugs? Just bought some coiled Alpaca (Bluebonnet Hills Alpaca ranch in Navasota TX) and they had 1 that had cotton core (suitable for knitting), and one that had a core that was suitable to weave a rug.